They are wonderful in the garden as a standard and single focal point, in mass, or as a container plant. This shrub has beautifully rich, dark green shiny foliage and when pruned properly, gorgeous plant form, thereby contributing to the beauty of a garden year round. Other positive attributes include the fact that camellias are relatively pest- and disease-free. What more could you ask for? There are many bloom types to consider when choosing your camellia: anemone, rose, single, formal double, peony, and many more. Both the C. japonica and C. sasanqua have many varieties to choose from. When making your selection, consider not only bloom form and color but also bloom time. 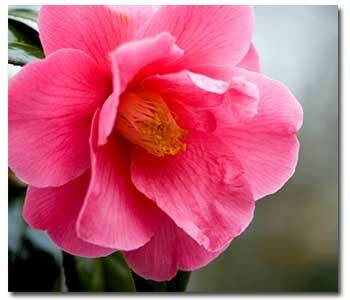 You can have your camellias blooming from September into May with a wise and thought out selection. Bloom form is important to most of us. If you live by the coast, talk with your nursery person to be sure that a more complex form with a higher petal count will open fully in spite of the morning and afternoon damp fog. Don’t despair, there are varieties equally beautiful but with a simpler form. There are so many attributes to each flower type that you just have to see them to appreciate them fully.